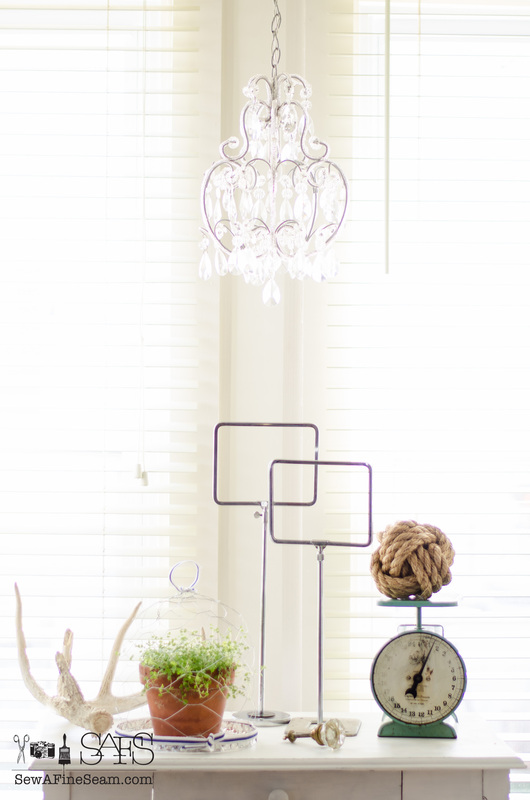 I’ve wanted to make a chicken wire cloche ever since I saw the one my friend KariAnne at Thistlewood Farms made. But since we live in town and don’t have chickens, I haven’t had any chicken wire just sitting around waiting for me to decide to use it in a crafty, creative way. 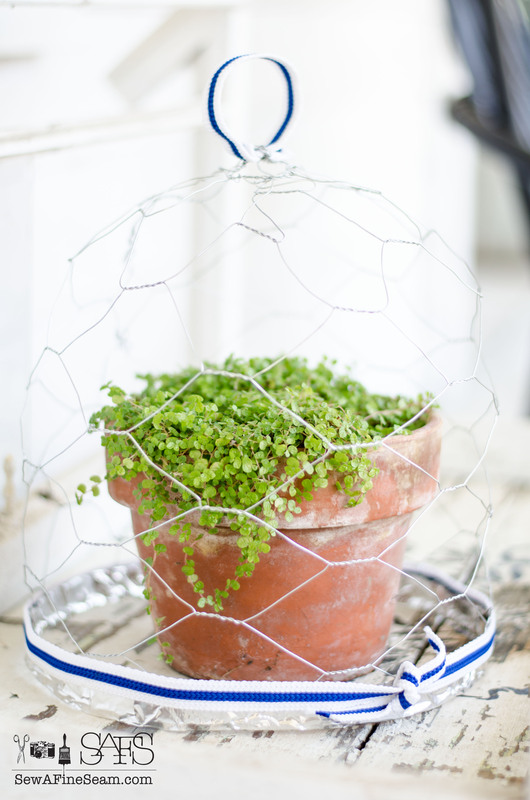 So I never made a chicken wire cloche. 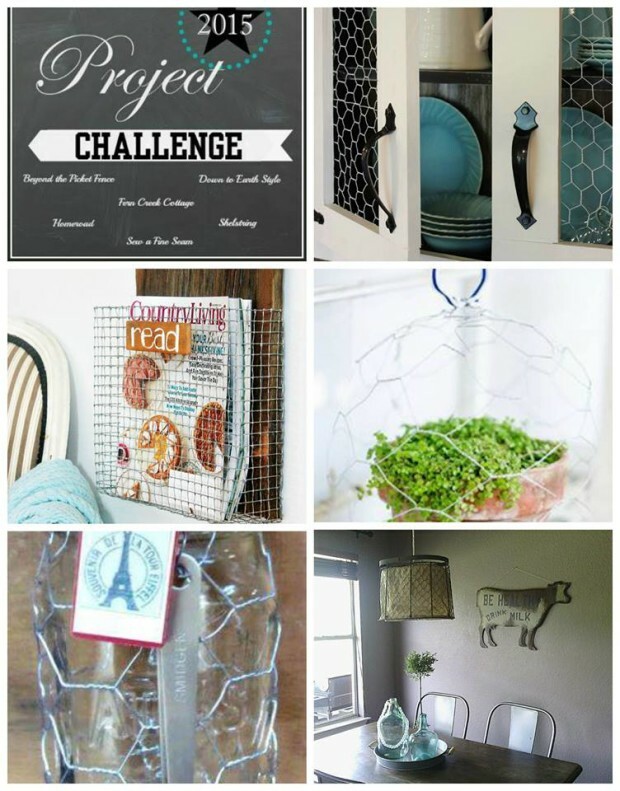 This months Project Challenge category is chicken wire. I really like KariAnne’s better because it’s the smaller chicken wire. But this is what my local hardware shop had and since it was only down the street and around the corner from me I went with it instead of driving 7 miles to the next, larger town. 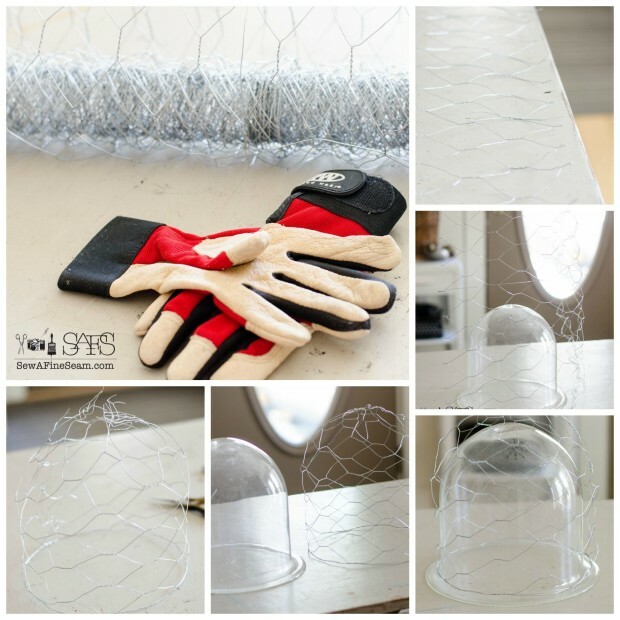 Making my chicken wire cloche was really quite simple. I cut the wire with a pair of jewelry wire cutters that were in my work room instead of hunting through my hubby’s tools for a pair of wire cutters. 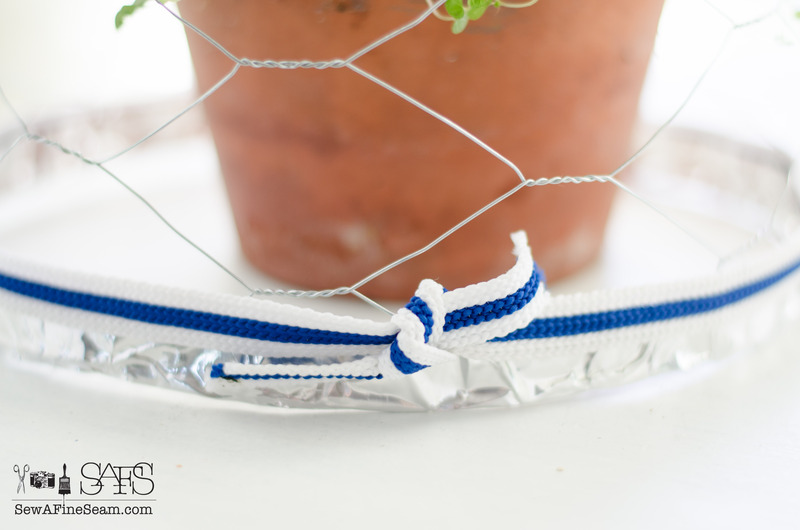 The small size of the jewelry cutters worked fine on the lightweight chicken wire. I used a glass dome I have as my guide for forming the cloche. 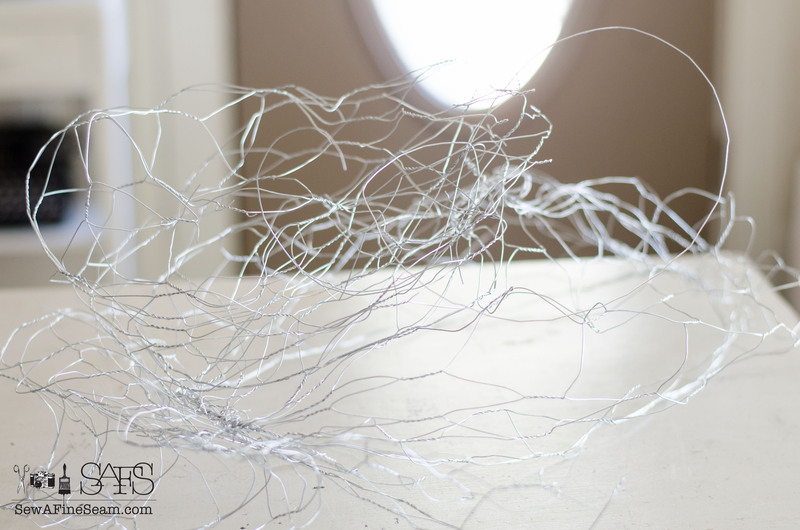 One straight side of the wire piece formed the bottom and I twisted the ends of the two cut edges together to form a tube of chicken wire. I used my gloved hands and in some places I also used a pair of needle nose pliers (also from the jewelry making set) to twist the wire ends together securely. For the top I cut the wire tube shorter and bent and worked it into a dome shape, cutting the wire out as needed. I just did what I thought looked good – no real strategy. I will share this mess with you – this was my first attempt. I tried a different approach – an idea I had in my head – but it wasn’t coming together right so I squashed it and started over. I had a whole role of chicken wire after all! I’m sharing this to show you that not every project is a success the first time! Sometimes they take a bit of trial and error so don’t despair if you don’t like your first attempt at something! Try again! I recently saw this post from my friend Kim, and was intrigued by the foil tape. So I asked at the hardware store if they had some. They did so I bought a roll of it along with the chicken wire. I wasn’t for sure how I was going to use it but my idea was to perhaps use it to glam up the bottom edge of my cloche a bit. I added the foil tape to the bottom – just folded the tape in half lengthwise and encased the bottom of the cloche in the tape. 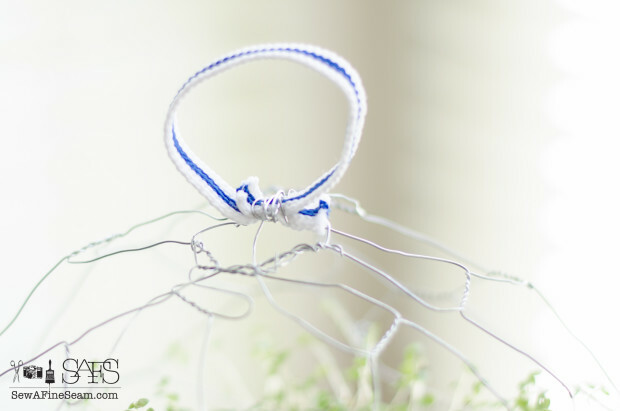 Some vintage blue and white ribbon tied around the cloche added a pop of color and fun. I created a handle for the cloche out of the same ribbon and wired it onto the the top. A bit rustic, a bit industrial, and a bit quirky, a chicken wire cloche adds a bit of fun and whimsy to home decor. 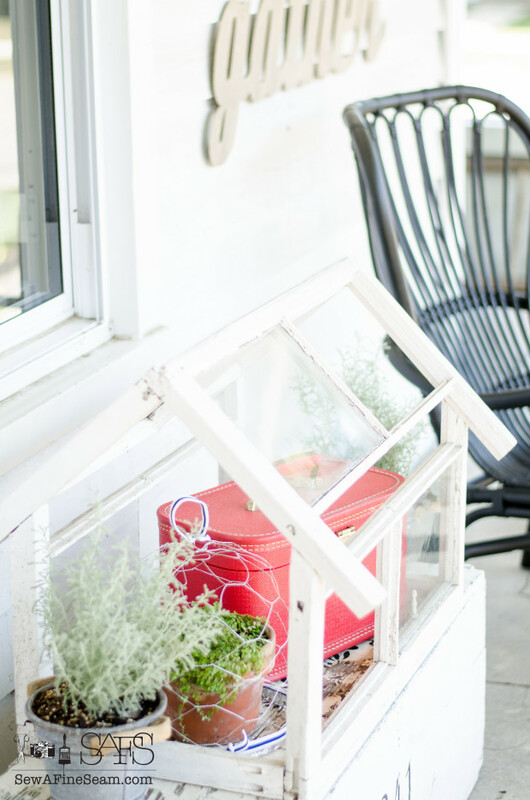 Inside or outside, it’s a fun way to bring some extra attention to a favorite plant. 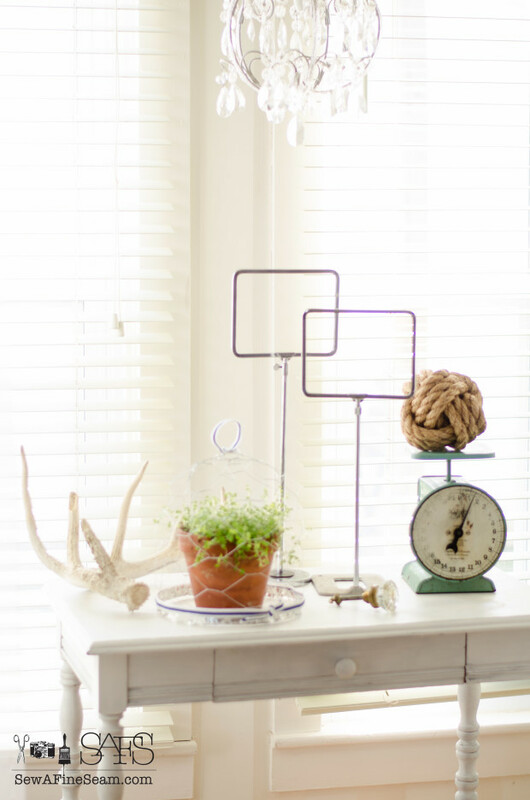 I like the nod to nautical the blue and white ribbon and the large rope knot lend to this vignette. This plant is one of the last baby’s tears plants I bought last spring. I bought a whole flat of them and used them for fun touches at the two pop-up shop events I attended this year. Most of them sold, but a couple of them found a home here. 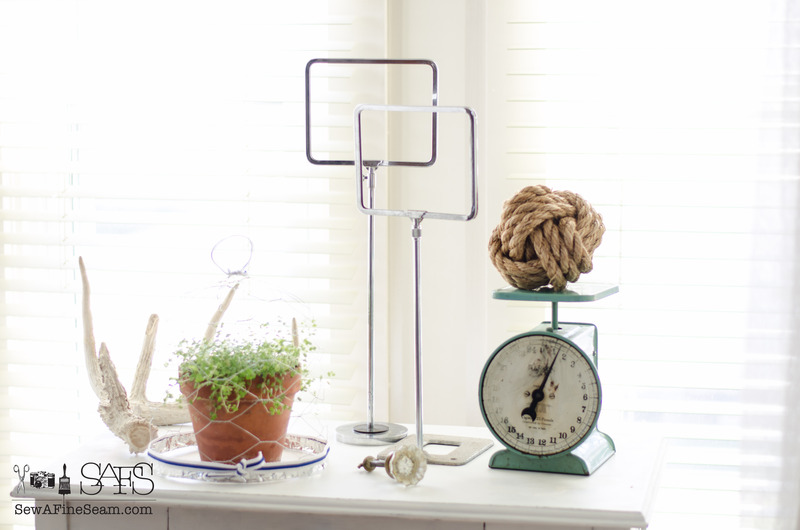 So tell me – have you ever made anything creative with chicken wire? Before you go make sure to click the links below to see what my friends came up with to make with chicken wire! Thanks Michele, I have a huge stash of ribbon and it’s fun to be able to add to my projects – it was fun that the blue and white seemed rather nautical when added to the same vignette as the rope knot. 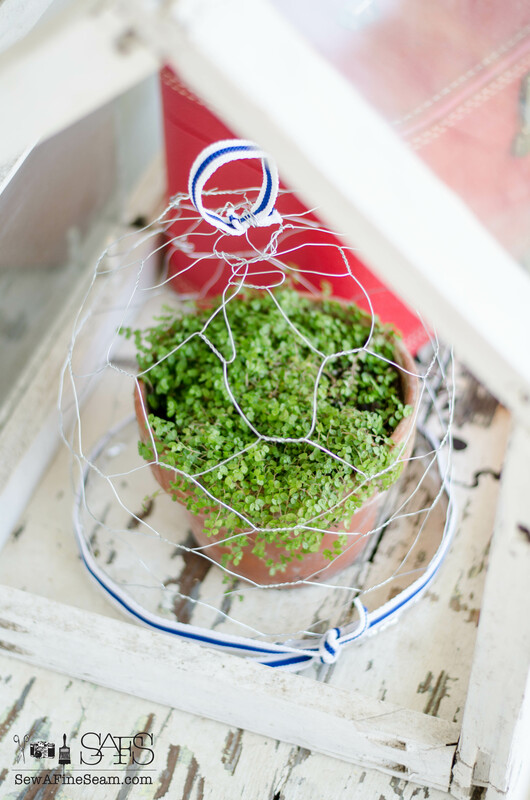 It is so cute and help elevate the everyday plant into something special! This came out adorable…so cute! Thanks Tammy! It was pretty simple after I figured out the direction to go with it! It is so stinkin’ cute!! I’m glad you showed us your first attempt so we don’t all feel bad when these things happen to us! Your cloche is just darling and I hadn’t heard of foil tape before and I am going to have to keep it in mind for future projects! Haha! I was happy to toss the first attempt but couldn’t resist snapping a photo to share! LOL! Oh, I love it! I really like the vignette with the scales and monkey’s knot! So fun! Love the ribbon touches. 🙂 It was a fun project. 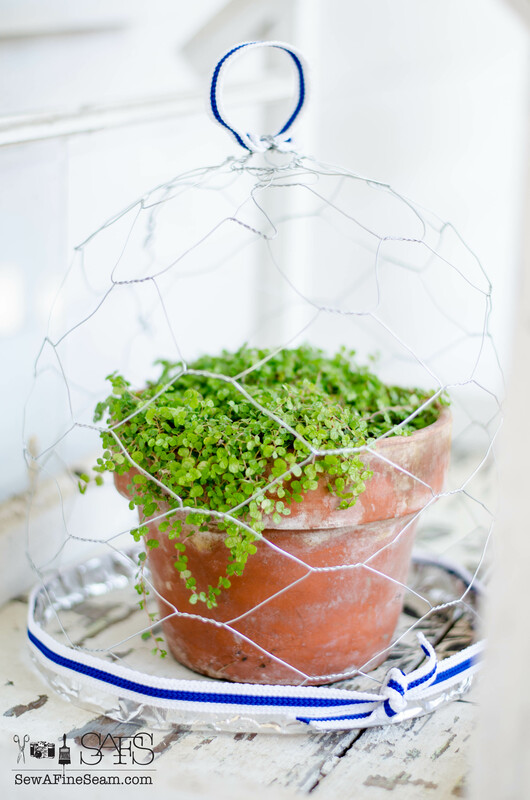 Your chicken wire cloche is beautiful! Thank you Susan, it was fun to make! wowsers, what a cute idea!!!!! Looks great and how clever of you. 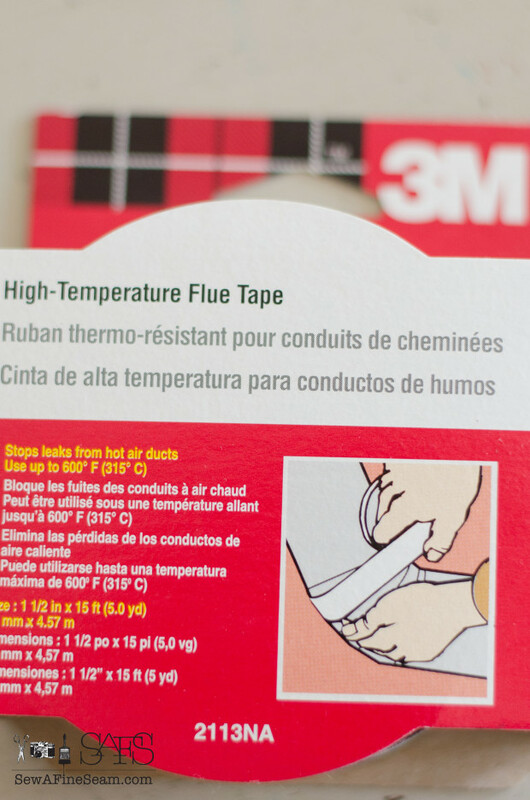 I never heard of foil tape but its a great idea for future creations. Thanks Tricia 🙂 Isn’t the foil tape cool? I was happy to find it!